Producer J. 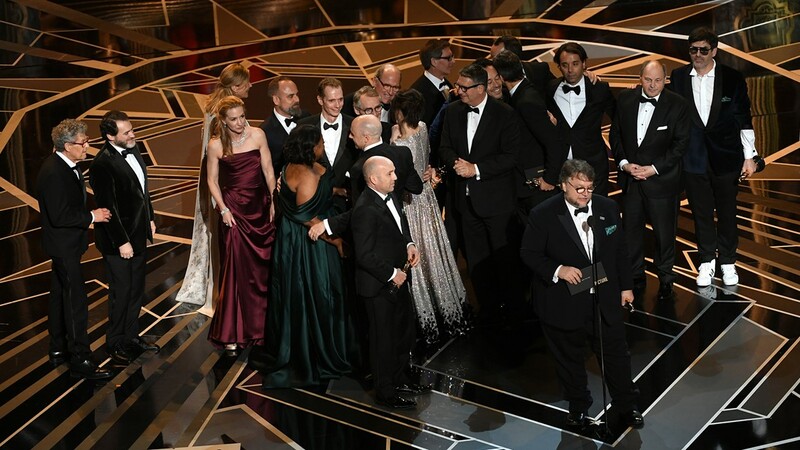 Miles Dale (L), director Guillermo del Toro (at microphone) and cast/crew accept Best Picture for 'The Shape of Water' onstage during the 90th Annual Academy Awards at the Dolby Theatre at Hollywood &amp; Highland Center. A general view shows the stage during the 90th Annual Academy Awards show on March 4, 2018 in Hollywood, California. 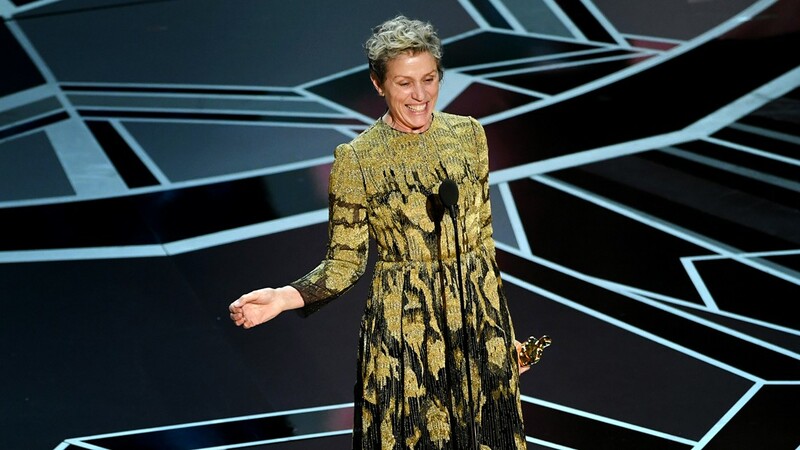 Actor Frances McDormand accepts Best Actress for 'Three Billboards Outside Ebbing, Missouri' onstage during the 90th Annual Academy Awards at the Dolby Theatre at Hollywood &amp; Highland Center on March 4, 2018 in Hollywood, California. 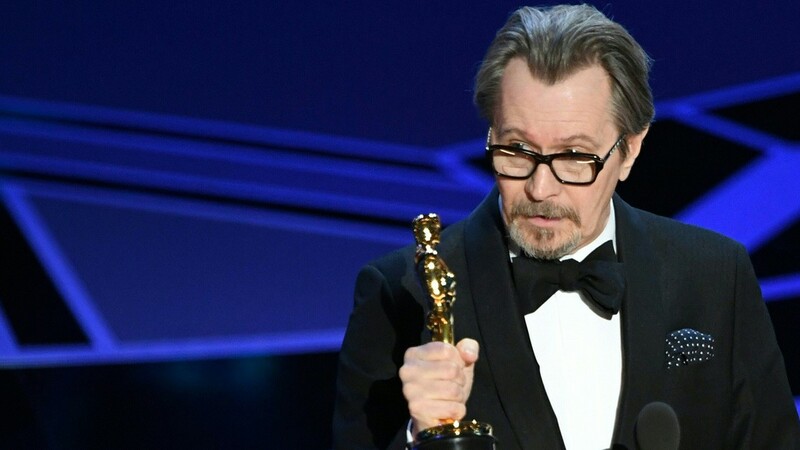 British actor Gary Oldman delivers a speech after he won the Oscar for Best Actor in 'Darkest Hour' during the 90th Annual Academy Awards show on March 4, 2018 in Hollywood, California. Director Guillermo del Toro accepts the Oscar for Best Director for 'The Shape of Water' from actress Emma Stone during the 90th Annual Academy Awards show on March 4, 2018 in Hollywood, California. 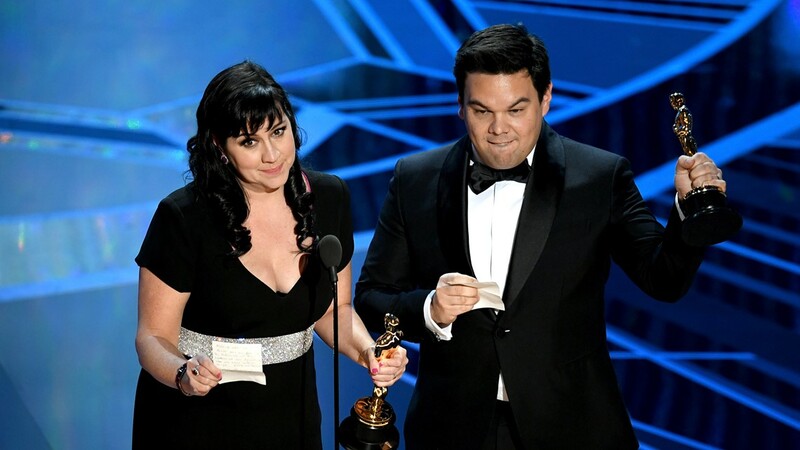 Songwriters Kristen Anderson-Lopez (L) and Robert Lopez accept Best Original Song for 'Remember Me' from 'Coco' onstage during the 90th Annual Academy Awards at the Dolby Theatre on March 4, 2018 in Hollywood, California. Composer Alexandre Desplat accepts Best Original Score for 'The Shape of Water' onstage during the 90th Annual Academy Awards at the Dolby Theatre at Hollywood &amp; Highland Center on March 4, 2018 in Hollywood, California. Actor/singer Keala Settle performs onstage during the 90th Annual Academy Awards at the Dolby Theatre at Hollywood &amp; Highland Center on March 4, 2018 in Hollywood, California. Cinematographer Roger A. Deakins accepts Best Cinematography for 'Blade Runner 2049' onstage during the 90th Annual Academy Awards at the Dolby Theatre at Hollywood &amp; Highland Center on March 4, 2018. Director Jordan Peele (C,R) is congratulated by British actor Daniel Kaluuya after he won the Oscar for Best Original Screenplay for 'Get Out' during the 90th Annual Academy Awards show on March 4, 2018 in Hollywood, California. 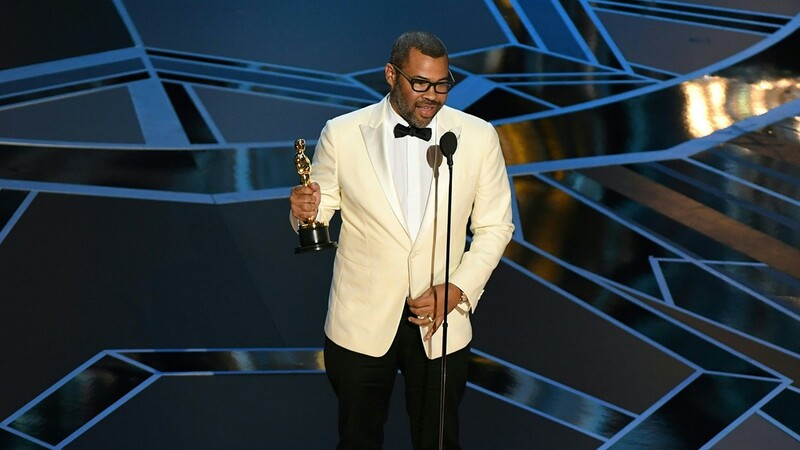 Director Jordan Peele delivers a speech after he won the Oscar for Best Original Screenplay for 'Get Out' during the 90th Annual Academy Awards show on March 4, 2018 in Hollywood, California. Screenwriter James Ivory accepts Best Adapted Screenplay for 'Call Me by Your Name' onstage during the 90th Annual Academy Awards at the Dolby Theatre at Hollywood &amp; Highland Center on March 4, 2018 in Hollywood, California. (L-R) Actors Ashley Judd, Annabella Sciorra and Salma Hayek speak onstage during the 90th Annual Academy Awards at the Dolby Theatre at Hollywood &amp; Highland Center on March 4, 2018 in Hollywood, California. Musicians Common (L) and Andra Day perform onstage during the 90th Annual Academy Awards at the Dolby Theatre at Hollywood &amp; Highland Center on March 4, 2018 in Hollywood, California. Filmmakers Rachel Shenton (L) and Chris Overton accept Best Live Action Short Film for 'The Silent Child' onstage during the 90th Annual Academy Awards at the Dolby Theatre at Hollywood &amp; Highland Center on March 4, 2018. Filmmaker Frank Stiefel accepts Best Documentary - Short Subject for 'Heaven Is a Traffic Jam on the 405' onstage during the 90th Annual Academy Awards at the Dolby Theatre at Hollywood &amp; Highland Center on March 4, 2018. 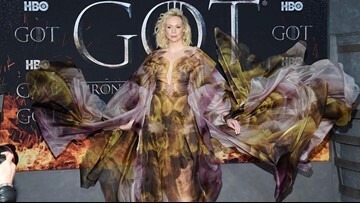 (L-R) Via video feed, actors Margot Robbie and Lupita Nyong'o, host Jimmy Kimmel, and actor Gal Gadot exit the theatre during the 90th Annual Academy Awards at the Dolby Theatre at Hollywood &amp; Highland Center on March 4, 2018. Actors Tiffany Haddish (L) and Maya Rudolph speak onstage during the 90th Annual Academy Awards at the Dolby Theatre at Hollywood &amp; Highland Center on March 4, 2018 in Hollywood, California. Australian Film Editor Lee Smith delivers a speech after he won the Oscar for Best Film Editing for 'Dunkirk' during the 90th Annual Academy Awards show on March 4, 2018 in Hollywood, California. Musician Sufjan Stevens performs onstage during the 90th Annual Academy Awards at the Dolby Theatre at Hollywood &amp; Highland Center on March 4, 2018 in Hollywood, California. (L-R) Filmmakers Adrian Molina, Darla K. Anderson and Lee Unkrich accept Best Animated Feature Film for 'Coco' onstage during the 90th Annual Academy Awards on March 4, 2018 in Hollywood, California. Host Jimmy Kimmel (R) speaks onstage during the 90th Annual Academy Awards at the Dolby Theatre at Hollywood &amp; Highland Center on March 4, 2018 in Hollywood, California. 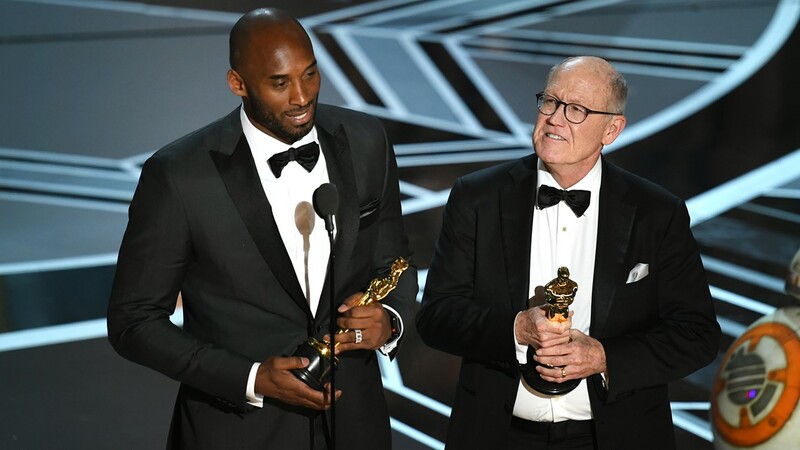 Filmmakers Kobe Bryant (L) and Glen Keane accept Best Animated Short Film for 'Dear Basketball' onstage during the 90th Annual Academy Awards at the Dolby Theatre at Hollywood &amp; Highland Center on March 4, 2018 in Hollywood, California. Actor Allison Janney (R) wins Best Supporting Actress for 'I, Tonya' with costar Margot Robbie (L) during the 90th Annual Academy Awards at the Dolby Theatre at Hollywood &amp; Highland Center on March 4, 2018 in Hollywood, California. 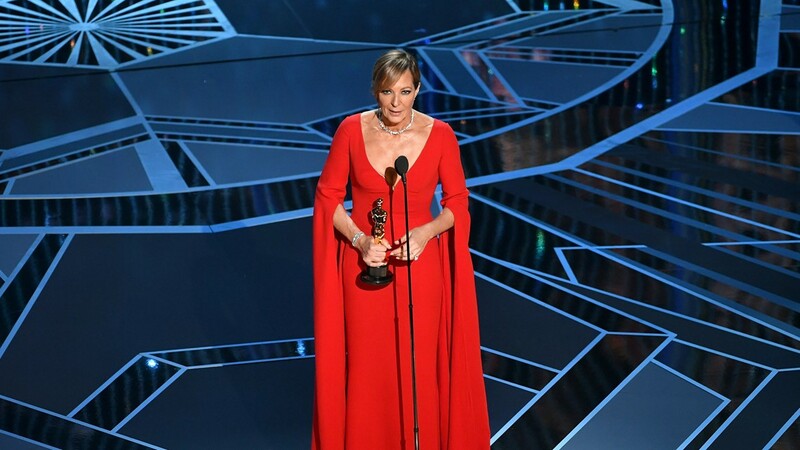 Actor Allison Janney accepts Best Supporting Actress for 'I, Tonya' onstage during the 90th Annual Academy Awards at the Dolby Theatre at Hollywood &amp; Highland Center on March 4, 2018 in Hollywood, California. Chilean director Sebastian Lelio (C) accepts the Oscar for Best Foreign Language Film for 'A Fantastic Woman' during the 90th Annual Academy Awards show on March 4, 2018 in Hollywood, California. 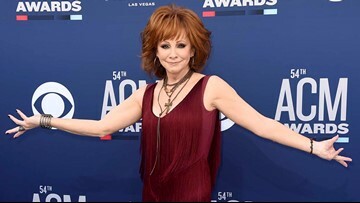 Actor Rita Moreno walks onstage during the 90th Annual Academy Awards at the Dolby Theatre at Hollywood &amp; Highland Center on March 4, 2018 in Hollywood, California. Singers Miguel (R) and Natalia Lafourcade perform onstage during the 90th Annual Academy Awards at the Dolby Theatre at Hollywood &amp; Highland Center on March 4, 2018 in Hollywood, California. 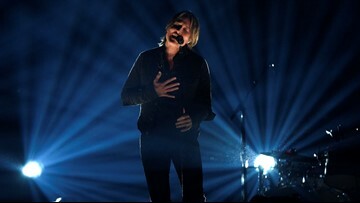 Singers Miguel (L) and Natalia Lafourcade perform onstage during the 90th Annual Academy Awards at the Dolby Theatre at Hollywood &amp; Highland Center on March 4, 2018 in Hollywood, California. (L-R) Production designers Jeff Melvin, Paul Denham Austerberry and Shane Vieau accept Best Production Design for 'The Shape of Water' onstage during the 90th Annual Academy Awards on March 4, 2018 in Hollywood, California. (L-R) Sound mixers Gary A. Rizzo, Gregg Landaker and Mark Weingarten accept Best Sound Mixing for 'Dunkirk' onstage during the 90th Annual Academy Awards at the Dolby Theatre at Hollywood &amp; Highland Center on March 4, 2018 in Hollywood, California. Sound designers Richard King (L) and Alex Gibson accept Best Sound Editing for 'Dunkirk' onstage during the 90th Annual Academy Awards at the Dolby Theatre at Hollywood &amp; Highland Center on March 4, 2018 in Hollywood, California. Comedian Jimmy Kimmel delivers a speech during the opening of the 90th Annual Academy Awards show on March 4, 2018 in Hollywood, California. Actor/singer Mary J. Blige performs onstage during the 90th Annual Academy Awards at the Dolby Theatre at Hollywood &amp; Highland Center on March 4, 2018 in Hollywood, California. (L-R) Producer David Fialkow, director Dan Cogan, producer James R. Swartz, and director Bryan Fogel accept Best Documentary Feature for 'Icarus' onstage during the 90th Annual Academy Awards on March 4, 2018 in Hollywood, California. Costume designer Mark Bridges accepts Best Costume Design for 'Phantom Thread' onstage during the 90th Annual Academy Awards at the Dolby Theatre at Hollywood &amp; Highland Center on March 4, 2018 in Hollywood, California. Actor Eva Marie Saint speaks onstage during the 90th Annual Academy Awards at the Dolby Theatre at Hollywood &amp; Highland Center on March 4, 2018 in Hollywood, California. (L-R) Makeup artists Lucy Sibbick, Kazuhiro Tsuji and David Malinowski accept Best Makeup and Hairstyling for 'Darkest Hour' onstage during the 90th Annual Academy Awards at the Dolby Theatre on March 4, 2018 in Hollywood, California. Actor Lakeith Stanfield speaks onstage during the 90th Annual Academy Awards at the Dolby Theatre at Hollywood &amp; Highland Center on March 4, 2018 in Hollywood, California. Actor Sam Rockwell accepts Best Suppoorting Actor for 'Three Billboards Outside Ebbing, Missouri' onstage at the 90th Annual Academy Awards at the Dolby Theatre at Hollywood &amp; Highland Center on March 4, 2018 in Hollywood, California. Comedian Jimmy Kimmel (L) and British actress Helen Mirren joke that whoever gives the quickest acceptance speech will win a jet ski during the opening of the 90th Annual Academy Awards show on March 4, 2018 in Hollywood, California.